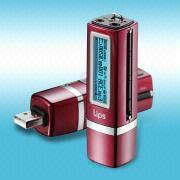 Lips, Lipstick Shaped MP3 Player | OhGizmo! Ok, ladies, listen up. It’s an MP3 player, with standard features, and up to 512Mb memory. It’s shaped like a lipstick, and uh, that’s it. And if you fall for this gimmick… then, well then, gee, I don’t know what to say. I mean, hey, they didn’t even include a real stick of red in there… Anyway, check it out here. Story VIA TRFJ. we are the professional manufacturer of MP3 Player, MP4 Player, in shenzhen, china. With an area of 4000 square meter, there are totally 12 production lines which can produce 15k mp3 player per day. All products purchased from ?Sungworld? have a replacement and exchange guarantee. Products are replaced if they are defect or non-working. Also included in our warranty package is a at least 12-month warranty.We promise to provide customers with highest quality, best price and best before and after-sales service. For more information about product, and price, please visit our website (www.sungworld.com ) or contact us directly for a detailed discussion.